Generous visitors to this blog who have come back a few times will have spotted that I have been working on a second project alongside the actual management of the Chayne. 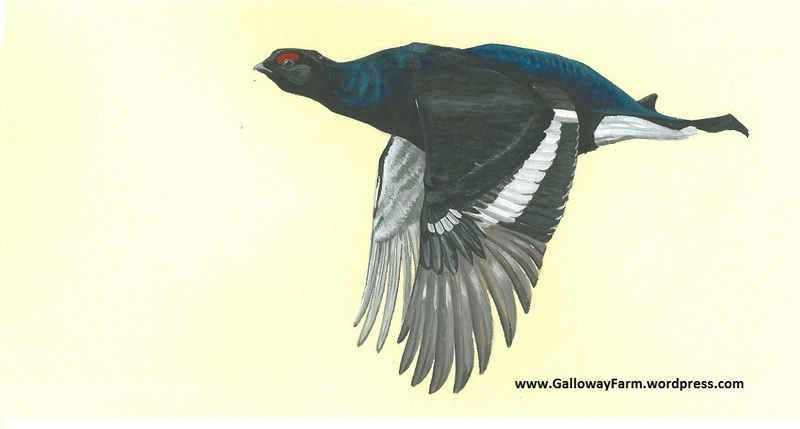 Over the last two years, I have been writing and illustrating a book about black grouse which covers natural and sporting history, moorland management and behaviour, and the due date for submission to the publishers is the last day in August. Despite having had more than two years to prepare for the deadline, the last week has been extremely busy. I have just had my illustrations back from the printers and the whole project is currently sitting in a brown envelope waiting to go into the post box. I just wanted to thank all of the readers who have helped with my research for this book and to let the nation know that, as of next summer, it should be available for sale in a bookshop near you! The publishers are yet to decide on a title for the book, but all progress with its publication will be detailed on this blog. In the meantime, the above illustration is designed to fill a gap by showing just how spectacular these birds really are. Incidentally, now that they have been scanned and their digital copies sent away, I find myself in the position of being able to offer over a hundred full colour gouache original paintings featuring black and red grouse for sale. 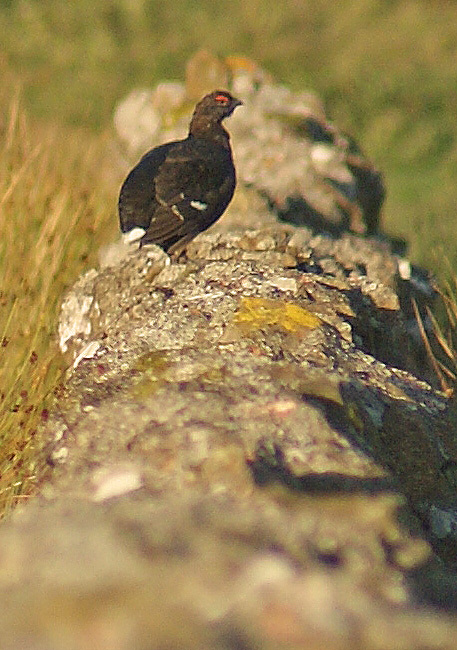 If you aren’t sick of looking at black grouse after visiting this blog and are prepared to have one hanging on your wall, get in touch… hawk, tout, wheeler deal etc. This doe has moved into the woodcock strip after my attempts to thin and brash the sitkas. 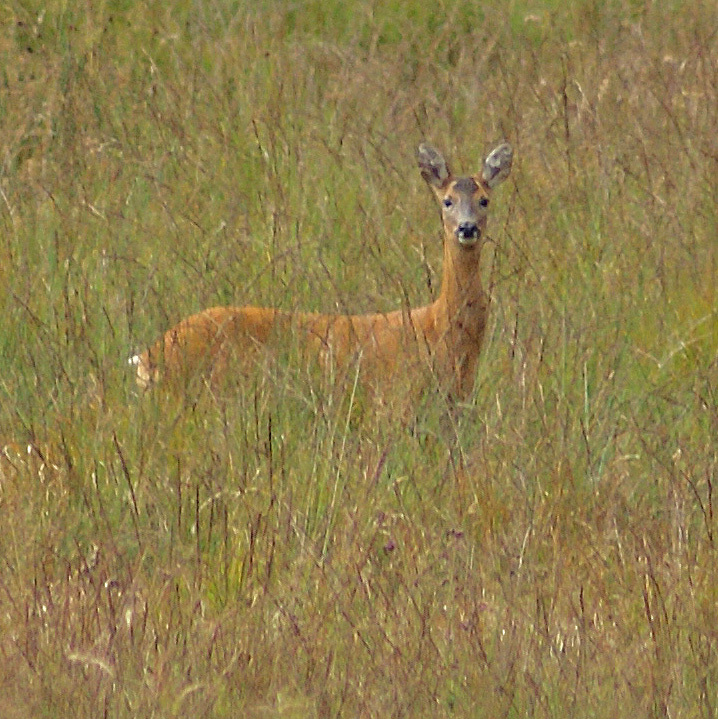 Amongst the various objectives I have for the Chayne, encouraging roe deer is a major goal. I love watching these animals almost as much as I love eating them, and the prospect of having some on the farm is really exciting. Since I began to clear out the woodcock strip last year, a single doe has started to spend time in there. As soon as the dense walls of sitka spruce had been brashed back and hollowed out, she appeared as if from nowhere and began to graze the fresh grash which was staging a comeback thanks to my work. It was hugely satisfying to know that she wouldn’t have been there if it wasn’t for me, and seeing that even a small change can make a difference to the local wildlife gave me a huge boost. Over the next few years, I plan to put in a few small patches of native woodland in some of the lower and boggier areas of the farm, and it will be fascinating to see whether the local roe will move in in greater numbers. So far I haven’t had the chance to shoot a buck this summer, but I hope that over the next few years, the Chayne will start to be able to provide me with one or two. With a bank holiday looming and little in the way of sporting shooting on offer on the Chayne, it seemed like a good idea to head up country and do some hillwalking. Of all the hills you can see from the Chayne, Cairnsmore of Carsphairn is perhaps the most dramatic. Just shy of 800 metres above sea level, Cairnsmore of Carsphairn’s exposed eastern crags often hold their snow long into April and early May, and the spectacular dual mounds of the hill are clearly visible from almost every vantage point on the moor. Driving up to Carsphairn was a great opportunity to see Galloway in the first throes of autumn, with loaded rowan trees and purple heather sweeping up from either side of the road to Ayr. The hill itself is a fairly straightforward climb, and after several miles of increasingly steep ascent, I reached the summit and soaked up the view. A clear day meant that I could see from Goatfell on the Isle of Arran to Snaefell on the Isle of Man, and every detail was picked out with astonishing clarity. 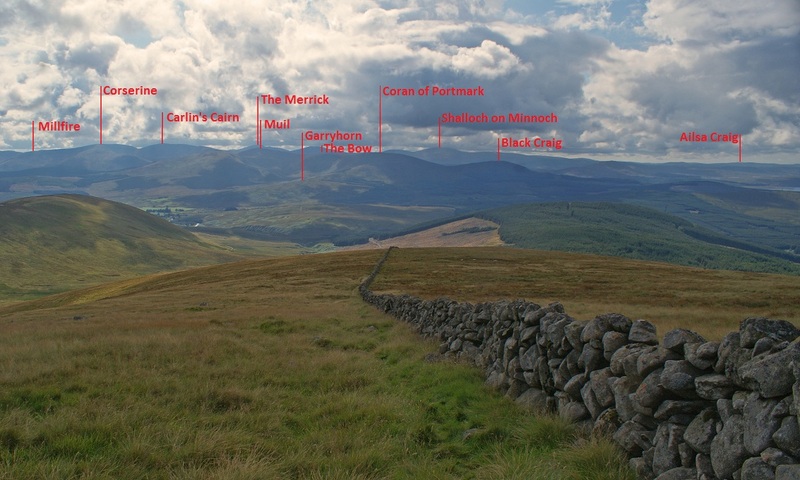 One of the great pleasures of Galloway for one who was born and grew up here is the fantastic and unique range of local dialects and place names which have become attached over the centuries to wild and remote corners of the county. I was a student of Scottish language at Glasgow University, so I can’t help indulging myself a little in mentioning the linguistics involved. After all, in a land where I am trying to conserve wildlife, human experience adds another dimension to meaning of the place. Galloway was its own country until the late thirteenth century. It became absorbed into Scotland at around the same time that Wales became absorbed into England, although our sense of national identity has withered and died away where the Welsh continue to remember their origins. Originally made up of a cocktail of Irish, Welsh and Manx celts, Galloway existed as an autonomous region for many years, even fighting bloody battles against both the Scots and the English to retain its independence. Although few people remember Galloway’s history today, there are still clues which point towards our own unique history, and they can be found across the length and breadth of the county in the form of names. A strong Norse and Viking influence in the area gave us names like Criffel, which when mixed with Galwegian Gaelic names like the Merrick and Millfire and the old Scots dialect words Curlywee and Cairnharrow creates a landscape as varied and unique as its history. High up in the Galloway hills, twenty miles to the west of the Chayne, you’ll find fantastic places with names like The Wolf’s Slock and The Black Garpel, both of which cower beneath the collected heights of the Dungeon of Buchan and the Murder Hole of Loch Enoch. Nowhere else in Scotland will you find such a rich and exciting mixture of dialects and place names, and knowing something of the region’s history makes a walk in the hills really come alive. Even when I reached the summit of Cairnsmore of Carsphairn, I had to peer over the shoulder of Craigenputtock to see the Chayne. Now there’s a name I envy. On the descent from the cairn, I had the rare luck to watch a merlin hunting wheatears along the back of an old drystone dyke, then saw two others rise from the boulder fields below to join it. As the old saying has it, time in the countryside is never time wasted. A case of myxi this late in the year is not unusual, but what could it mean for my chances of ferreting this winter? After an idle summer, my ferrets are looking forward to getting stuck into their winter work, spreading chaos and heartache amongst Dumfries and Galloway’s rabbit population. The farm where we had such fun ferreting last year continued to carry a strong stock of rabbits long after the informal season closed, and I was hopeful that high densities of bunnies might mean that I was in for a sporting winter this year. 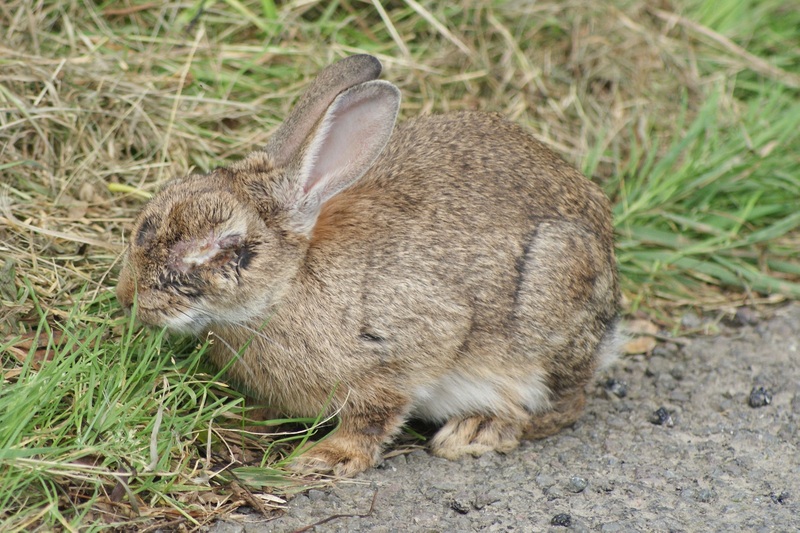 Sadly, the first signs of an outbreak of myxomatosis appeared a few weeks ago and it now looks like there could be quite an epidemic. A distorted and unhappy rabbit is not a sight that anyone likes to see, but I am particularly miffed about this outbreak which threatens to damage my ferreting chances this coming winter. From an ecological perspective, rabbits singlehandedly support their own complex tier of predatory animals, so when their numbers drop suddenly, all sorts of other birds and mammals will start to feel the pinch too. In recent years, myxomatosis is becoming much less devastating as rabbits build up immunities, but there is every chance that when I come to enter my ferrets in October, the boat will have sailed. Where's his tail? He's back in action, but not looking his best. Following the total collapse of a nine foot section of march dyke over the weekend, I headed up to the farm this evening to fix it. Through the binoculars, it looked like a simple job to put the coping stones back up, but when I got close, I saw that the entire dyke had sagged into the moor. It’s not surprising, considering that that section is more than two hundred years old, but it did mean that I had to strip the whole lot out down to the foundations and build it up from scratch. I’m not the world’s greatest dyker, but with a lovely sunset and a female hen harrier working through the rushes below me, there were plenty of worse ways to spend the evening. After an hour, I looked up to see that my favourite blackcock had landed just fifty yards away and was eyeing my progress with a critical eye. He didn’t exactly say “oo, I wouldn’t have put that stone there”, but his expression clearly revealed the fact that he was not impressed with my handywork. I returned the compliment by noting his shabby appearance and lack of tail. Now that he has reappeared from the worst of his moult, he is as strong on the wing as he ever was, despite still having the brown feathers on his head and neck. Now in his third year, he has lost all traces of brown on his wings and back, and has earned himself a bolder white stripe across his wings than ever before, but time will tell how his tail will look. Knowing how feathers grow, it’s hardly surprising that his long tail feathers should be the last to come in, and I’m already looking forward to seeing how smart he’ll look when he starts to show off in February next year. When bracken and heather collide, there's only going to be one outcome. Having spent the whole of yesterday with a heavy knapsack sprayer on my back, I can honestly say that bracken control is not exactly a barrel of laughs. Lugging a leaky sixteen litre container full of Asulox over the hillside, spraying the crisp fronds of chest high bracken with a woefully small jet fitting feels like a thankless task, but the nature of this herbicidal chemical will mean that that voracious and expansive plant will take a real beating over the winter. Asulox appears to be absorbed through the leaves where it follows the receding sap down into the root system. From there, it works havoc on the plant and knocks hells bells out of it’s robust constitution. I’m no biochemist, but having seen Asulox used on bracken banks in the past, it’s obvious that this solution is a real asset to anyone with an interest in heather. Bracken is only visibly alive for about four months of the year. The rest of the time, it lurks beneath a woody mat of dead leaf material that is almost impenetrable to all other vegetation. Bracken leaks fluids into the soil which inhibit the growth of other plants, and when it rushes into the sky in May and June, it smothers all surviving competitors to death. 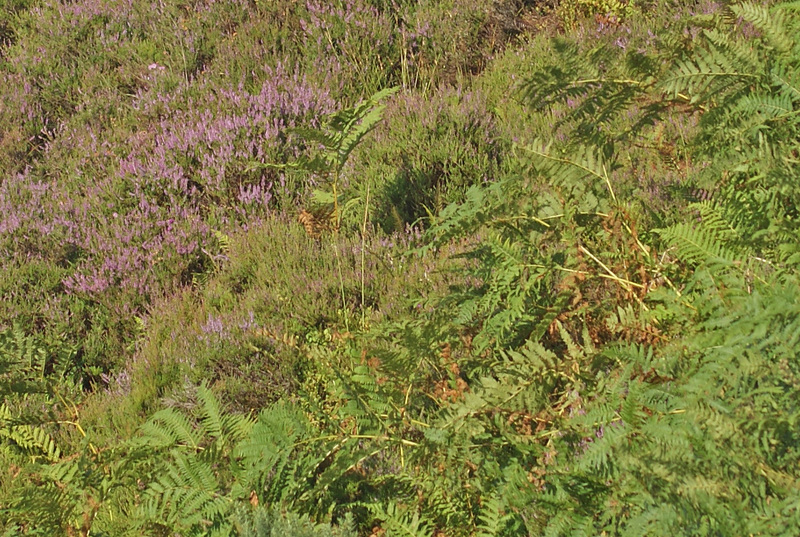 When bracken and heather grow in close proximity, heather doesn’t stand a chance. Without proper maintenance, pristine moorland can turn into a sea of bracken in no time at all, and by comparison to the massive biodiversity supported by a heather based ecosystem, bracken is a wasteland. Not only does bracken smother other plant life, but the dense bed of leaf litter it leaves is a dream come true for ticks and parasites. Red grouse are very susceptible to louping ills caused by tick infestations, and these problems are compounded and magnified by bracken banks adjacent to open heather. Black grouse don’t seem to be able to catch louping ill, and young broods like spending time in bracken, but wherever there are ticks, there are problems. On the whole, bracken is bad news for wildlife, so when I set off onto the moor with a container of anti-bracken chemicals on my back, I felt like I was fighting the good fight. After eight hours, I had sprayed more than one hundred litres of the stuff, and I hope that my efforts will have halted the spread of this insidious weed as it began to approach the grouse moor. Sadly, I won’t see the benefit of my work until next May, but having made a start on the Chayne’s healthy crop of bracken, I can keep an eye out for problem areas next year. I will admit that seeing a helicopter spraying thousands of litres of Asulox on Monday on the neighbouring estate, I did feel a little envious, but until I can afford to bring in a contractor, I need to deal with the problem with my own hands. At a time of year when buzzards are at their most conspicuous, the added bonus of a free meal really brings them to the forefront. 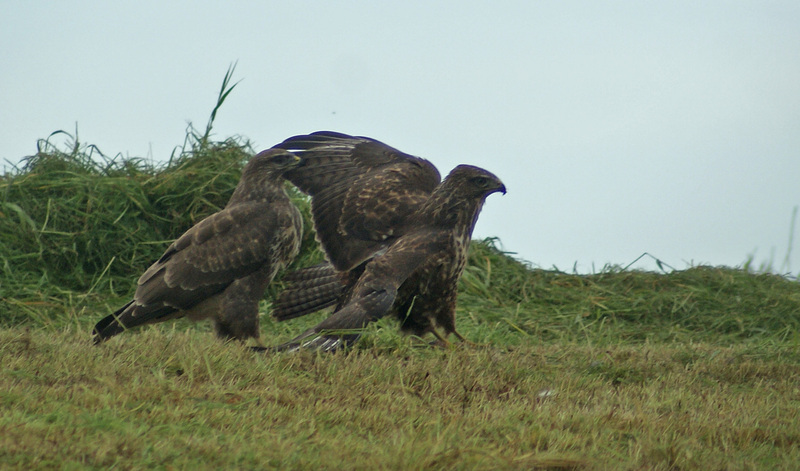 Driving home from work this evening, I came across three buzzards in a field of freshly cut silage, all bowing their heads together in a small party. Pulling over, I got out of the car and crawled through the undergrowth to a point at which I could see what they were up to. It emerged that a rabbit had been sliced to bits by a silage cutter, and these venerable priests were administering the last rites. Galloway has recently become well known for its population of red kites, and these birds are building a strong relationship with carrion in silage fields, so it follows that buzzards would be on hand to pick through the best of the agricultural carnage as well. Having once come across the tattered remains of a roe kid in a row of cut silage, it seems that these accidents happen all too often. For once, I was grateful that the buzzards were around to help tidy up.